This weekend our family headed south to visit some of our best friends and their new baby. We packed up the van with all the necessities including a DVD player with dual screens and DVDs, lots of snacks, markers and paper, and of course books by Tom Lichtenheld! According to Tom Lichtenheld's book, Everything I Know About Cars: A collection of made-up facts, educated guesses, and silly pictures about cars, trucks, and other zoomy things, "a road trip is a way for the whole family to spend time together and annoy each other in interesting new places." We anticipated lots of annoying behavior with four and half hours to spend in tight quarters with three young children. However, much to our surprise, the time in the van was quite pleasant and I found myself thanking my children before bed tonight for their wonderful behavior. Tom Lichtenheld became children's book author and illustrator while having great success in the world of advertising. He was able to publish his first book, Everything I Know About Pirates, in 2000 after "creating 20 pages of silly pictures and nonsense about pirates" for his nephew Adam. (TomLichtenheld.com) I first learned about Lichtenheld after he published the New York Times Bestsellers Duck! Rabbit! with Amy Krouse Rosenthal and Shark Vs. Train with Chris Barton. The latest book he wrote and illustrated is Cloudette, a book about a small cloud with a BIG spirit. I couldn't help looking out the window hoping to see her on our trip this weekend. 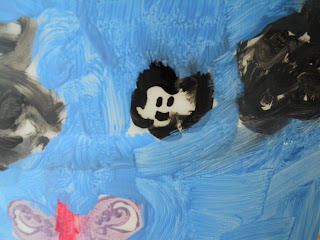 On the blog Get to the Point, from the MacMillan Children's Publishing Group, Tom Lichtenheld described a writing activity that he conducted with children that lead to the initial idea for Cloudette. 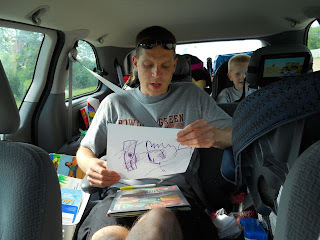 In between DVDs of Go Diego Go and Arthur we occupied about 45 minutes of our ride with one of two activities to celebrate Tom Lichtenheld's birthday. While in the van, I told my children that the idea for Cloudette began as "two scraps of paper". 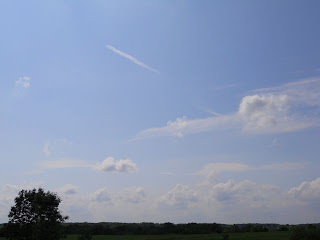 One scrap said, "cloud" and the other said "on the roof". The "cloud" scrap came from a paper bag labeled CHARACTERS. The "on the roof" scrap came from a paper bag labeled SETTINGS. To replicate this creative activity, my children took turns coming up with cool characters -- pancake, butterfly, capybara, etc. -- which I wrote on tiny pieces of paper. Then they thought of many interesting settings -- at the zoo, on an island, in the park, etc. I made two piles, setting and characters, with their ideas. They each chose one card from each pile, just like the children did with Tom's activity. My children each drew a picture to match their selections. My son drew a picture of a pancake at the zoo and my daughter drew a picture of a butterfly at the park. In the picture above I was asking my son to tell me more about the pancake at the zoo. He told me, "A zookeeper nibbled him and syrup came out!" This video reminded me of an email that my friend had sent me, sharing photos of his new rain barrels that he had made for his yard. I thought the white barrels would be the perfect canvas for an art project this weekend. 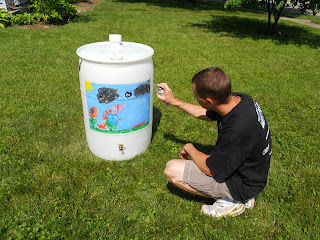 Painting a rain barrel with a scene from Cloudette would be a perfect way to complete our Tom Lichtenheld celebration! Before we started painting, my kids and I introduced Cloudette to my friend's 1 year old son. He loved pointing out Cloudette on each page. We defined our painting area with duct tape. 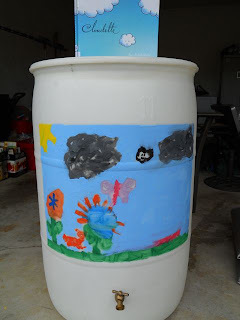 We used acrylic paints, paintbrushes (foam and bristle), and stamps. My daughter received the honors of painting Cloudette. The kids all took turns adding elements to the scene. Lastly my friend added the sky along with help from my daughter. The finished project with a closeup of Cloudette below! Once the painting was dry I sprayed a layer of clear acrylic paint to protect our masterpiece. My birthday falls on Flag Day, June 14th. Flag Day is a minor holiday, mostly noticeable by the flying of flags and closing of banks. Here's a cool old poster commemorating the day. Both the flag and the poster are objects of inspired beauty. The only thing that would make it better would be if James Montgomery Flagg had designed the poster. (More about the poster, click here.) Darn, no such luck. Speaking of coincidences, when I was a kid, my parents told me all the neighbors were flying flags in honor of my birthday. Of course, they deny this little fib now, but it's not the sort of thing a person forgets; sort of like seeing Mommy kiss Santa Claus. The coincidence of my birthday and this holiday has given me a special appreciation for our flag, and a reverence for flag protocol. It bothers me to see it flown improperly; out in the rain, still up after dark, or touching the ground. I'm not a gung-ho flag waver, but if I were, I'd wave it properly. After all, it's flying in my honor. Right, Mom? 8. Other Trailers - Shark vs. Train, Goodnight, Goodnight Construction Site, Duck! Rabbit! WOW! I think you guys had a better Tom-Birthday than I ever have. Well, there was that one time when I turned 8 that I hit two home runs in one game...and the time when I turned twelve that I got a Monkees record. But, other than that, you had my best birthday EVER! Thank you! Tom, the celebration could not have been possible without your great books! Thanks again for everything! Excellent post! Emmy and I love reading Tom's books especially Bridget's Beret. Emmy still wears a beret every time she paints - just like the real masters! Happy birthday to you Eric! Didn't know it was his birthday this week when I planned our Cloudette craft! I do love your rain barrels. 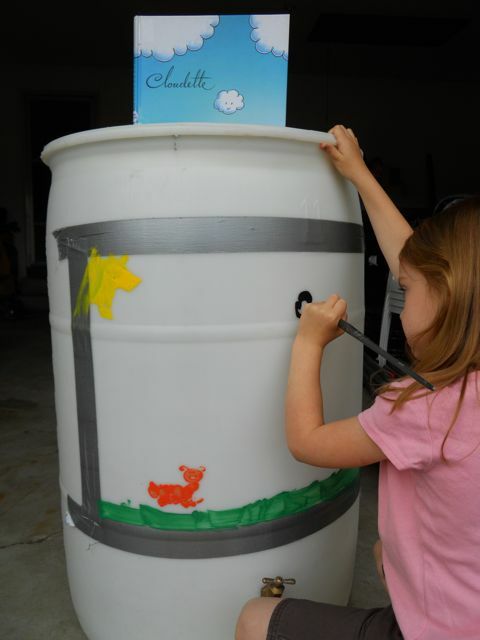 we love cloudette :) great activities and blog. I am a Tom-fan, my latest favorite is Emergency! 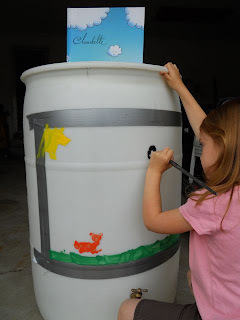 I love how happy you can make these authors with these unique birthday celebrations Eric... this whole family project was COOL! I just got Emergency today at the library. Looking forward to reading it! Thanks Joanna! Outstanding! Wow, I am so impressed with all these activities, as usual, AND all those amazing activity packs on Tom's website. Talk about organized. My boys are obsessed with moving vehicles and anything in the sky, so I will definitely be stocking up on Tom's books. So nice of Tom to stop in, too! It warms the cockles. Your comments always make me smile! 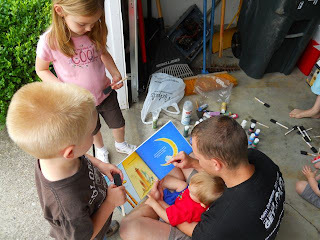 Eric, you always have the coolest activity ideas to go with the books you read to your kiddos! 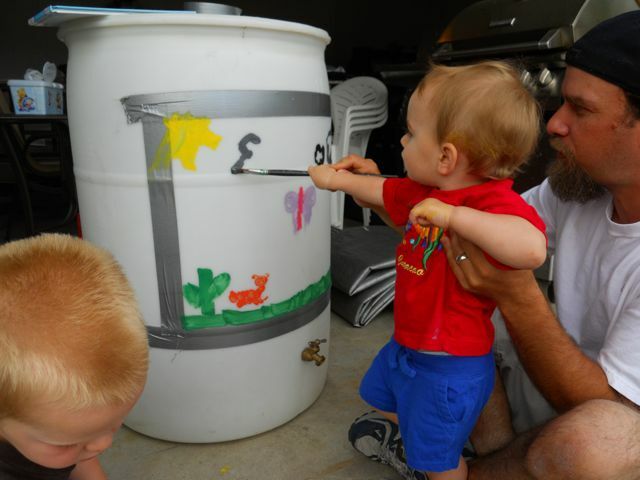 We've been talking about getting some rain barrels and now I have something fun to do with them. Thank you for another great post! Thank Heather. 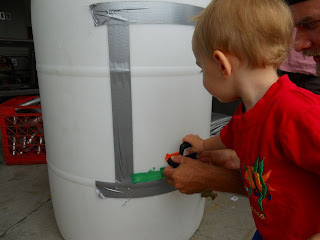 I highly recommend rain barrels. The hardest part was actually finding the barrels. 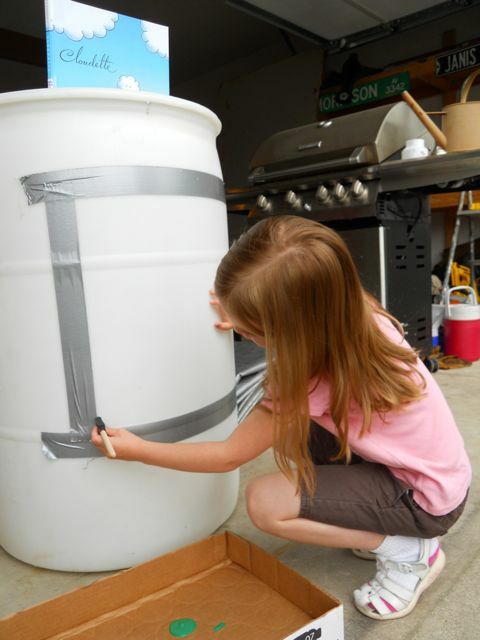 Once I got a hold of a few, it was pretty easy to make with right tools. 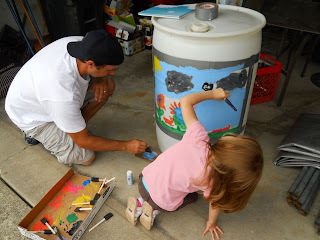 You and your kids are just so creative! Looks like a fun time celebrating. How cool to have Tom even comment on your blog! Thanks Tina! I was very happy Tom was willing to contribute to the blog post! What an amazing post! And just in time for the next leg of our road trip. I'm going to do the characters/settings exercise for sure. Thanks for, as always, sharing your phenomenal celebrations with us. Thank you Julie! Enjoy your trip. I would love to hear the results of the activity.